CAPTAIN UNDERPANTS returns! In their ninth epic adventure, George and Harold encounter a familiar face - Professor Poopypants! He now goes by the name Tippy Tinkletrousers and is determined to seek revenge for all of the teasing his old name inspired. Armed with his laser-shooting Freezy-Beam 4000, Tippy Tinkletrousers is ready to zap anyone who stands in his way. Now it's up to George, Harold, and the amazing Captain Underpants to stop Tippy Tinkletrousers' reign of terror before it's too late! 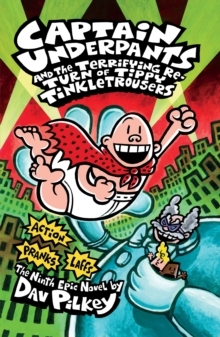 More titles available: THE ADVENTURES OF CAPTAIN UNDERPANTS (9780439014571), CAPTAIN UNDERPANTS AND THE ATTACK OF THE TALKING TOILETS (9780439995443), CAPTAIN UNDERPANTS AND THE INVASION OF THE INCREDIBLY NAUGHTY CAFETERIA LADIES FROM OUTER SPACE (9780439997102), CAPTAIN UNDERPANTS AND THE PERILOUS PLOT OF PROFESSOR POOPYPANTS (9780439998192).